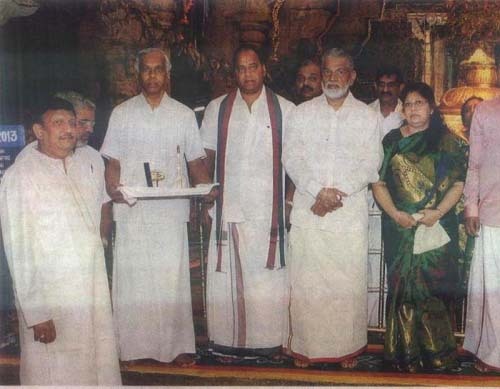 On the eve of the launch of Mangalyaan, G Madhavan Nair, ISRO chairman K Radhakrishnan (First row, fifth from left) offered pujas at the Tirupati Venkateswara temple, about 100km from the launch pad, with miniature replicas of the rocket and the Mars orbiter spacecraft. He was following a tradition started by his predecessor G Madhavan Nair. Scientists said they were enjoying a "very serious business" with enough lighter moments. A scientist quipped if it was more than a coincidence that the Mars mission named Mangalyaan falls on a Mangalvaar (Tuesday, the day of Mars, called Mangala in Indian astronomy). "We know we have done a great job," chipped in another, "but let's not complain if there is a little divine intervention." The launch was postponed from October 28 (a Monday) since one of the two radar-fitted ships that are to track the rocket from the South Pacific Ocean had not reached its destination due to bad weather. A Western-style interpretation of the horoscope for the day of the launching (Nov. 5) is quite unfavorable: Mars was in opposition to Neptune and in square to the Moon, or in other words, the targeted planet was doubly afflicted. True, half of all Mars missions have failed, as well as ALL first-time Mars missions, so experts are pessimistic about the outcome, yet the ISRO would have been well-advised to wait for a favorable planetary configuration instead of relying exclusively on rituals. Progressions on the horoscope might indicate the exact moment when all control over the artifact will be lost. Who shall find a good astrologer? For his or her price is far above rubies. When you keep your eyes closed and establish an arbitrary principle for an event without seeing the cause - effect relationship, you are said to be in the state of blind faith. In another situation, you keep your eyes open to the extent of microscopic and macroscopic vision and establish a principle for an event by repeatedly measuring the cause - effect relationship, you are blessed with scientific vision. Thirdly, although you keep your eyes open to the extent of microscopic and macroscopic vision but unable to establish a principle for an event because the parameters determining the event are beyond your refined vision and thus you cannot measure the cause - effect relationship. In this case you have no option but to keep faith in supernatural power.